We sit back in the Hells Canyon Raft office watching it snow today, anticipating the spring when all this snow turns into a river. The river season is just 5 months away. I am always amazed when I stand on the bank of a huge river like the Snake River through Hells Canyon. Amazed at how much water continually flows. It never stops. A favorite question from our guests is, “when is the river best?” I answer simply; it’s great all the time. One of the huge benefits we have in Hells Canyon is that the river is Dam controlled. This may seem a bit bizarre saying that a huge river controlled by a dam has a benefit. In some ways it isn’t. But in some ways for Hells Canyon Raft it is. Constant flows in the summer and a slower release of the spring run-off helps run a more predictable trip through Hells Canyon. Typical Spring flows on the Snake River are higher because of the snow melt and run off. There are many factors that play a role in how high the river will be. The largest factor is how much snow the Snake River basin receives during the winter. This is a huge drainage that starts close to West Yellowstone National Park, travels across Southern Idaho, turns north and forms Hells Canyon, and ends with its confluence with the Columbia River in Washington State. Usually we see higher flows in Hells Canyon starting in early May and continuing through early June. If you are looking for the possibility of rafting huge whitewater this is a great time to go. 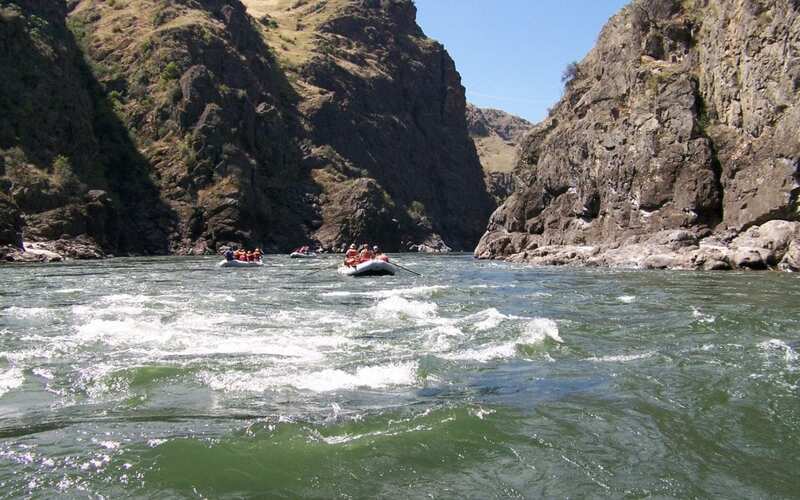 We also offer a 4-day river trip that covers the entire 81 miles of Hells Canyon. This 4-day trip is usually done in 5 or 6-days later in the summer. By the first to second week in June the Snake is starting its normal flows. Which means it is prime time for the rafting season. The water temperature is in the high 60’s, and the rapids are at their best. This is perfect timing for family rafting, and the start of summer. A 3-day river trip covers the upper 34 miles of Hells Canyon. This section holds most of the larger class III and class IV rapids. A 4-day trip during June will take you below Pittsburg where the river alternates between narrow canyons with fun rapids, and wide open mountains with basalt cliffs. By late July the 81 mile trip switches to 5 or 6 days. Normal flows continue through September with the water temperature getting up to 73+ by the end of July. The Fishing… it is always fantastic! September trips are some of my favorites. The colors are changing, the nights are a little crisper, but the water is still warm and the rapids amazing. After the second week in September HCR can launch a trip any day you wish. This allows us to offer a small group charter trip where you can have the trip all to yourselves.